In my second book Still On The Sound, I mentioned a novel called My Side Of The Mountain by Jean Craighead George, which I had hugely enjoyed as a youngster. I wrote to the author, then aged 90 and living in Chappaqua, New York (as far as I know, she still is), and she sent a charming reply which ended with a reference to my 'auspicious last name'. The only Faulkner novel I had read was As I Lay Dying, and I knew almost nothing about the man himself. So I did a little research and discovered that his family name was not, in fact, Faulkner, but 'Falkner'. Exactly when and how it came to be changed is, like many of the details of Faulkner's colourful life, a matter of debate. It may have been that his records as an employee of Remington Repeater Rifles had the name wrong, and it somehow stuck; or (a much better story) that his name was miss-spelt on the title page of his first novel, and that when asked if he would like it changed, he replied, 'Either way suits me'. But it's a detail. 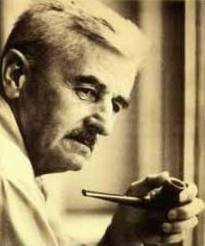 The remarkable thing about William Faulkner is that without having graduated from either high school or university - much of his education came from his mother Maud and a black woman named Caroline Barr who helped to raise him - and against a background of poverty and depression (the Depression) in Mississippi, the most disadvantaged of all the southern states, he managed to produce one of the most monumental bodies of work in the history of American literature; mostly, even later in his career, to pay the bills. He hated the notion of celebrity, and my favourite story about him is that when he was told he had won the Nobel Prize for Literature in 1949, he didn't even mention it to his teenaged daughter - she found out when the school principal called her in to talk about it. "Let the writer take up surgery or bricklaying if he is interested in technique. There is no mechanical way to get the writing done, no shortcut. The young writer would be a fool to follow a theory. Teach yourself by your own mistakes; people learn only by error. The good artist believes that nobody is good enough to give him advice. He has supreme vanity. No matter how much he admires the old writer, he wants to beat him." The reason William Faulkner came to mind was that he was born on this day in 1897.